Crete is a popular Greek Island packed with rural charm, famous archaeological sites, seaside towns with fabulous seafood, caves of historic significance and so much more. This guide will lead you to a hike through the deep and inspiring Samaria Gorge, a visit to the best of many archaeological sites in Greece, a walk in the countryside with a stop at the famous cave where Zeus was said to have been born, and you'll find out about the cities. All of this is available to do on inexpensive public transportation. There's really no need to rent a car and drive on Crete's narrow and winding roads, a bus can do it better—and often cheaper. Most people get to Crete by Ferry. You can take a ferry from Piraeus (the port of Athens) directly to Crete. It takes about 9 hours on standard, lumbering but romantic ferries—but around 6 hours on the newer ferries. The ferries are timed to arrive early in the morning to Crete, so you can save the cost of a hotel by sleeping on the ferry during the crossing. Get there early for boarding, as the port can get confusing and complicated with all the motor traffic arriving. Allow for some flexibility in your sailing because ferries can be canceled in case of very bad weather. You can choose ferries that land in Heraklion, Chania, or Rethymno. The boat to Chania actually lands in Souda port, a short way from Chania. Ferry lines serving Crete are Minoan, ANEK, and SuperFast. Crete is also served by three airports. Heraklion is served by Nikos Kazantzakis Airport, Chania is served by Chania Airport, also known as the "K. Daskalogiannis" airport, and the new and smaller Sitia Airport. Summers are full of tourists, and the paths are narrow. Opt for the off-season, but not too far off or you'll find fewer ferries and ways to get around. If you can, plan to spend a week or more in Crete. Crete is relaxed and laid-back, and there's a whole lot to see. It's also pretty far from anywhere else, and you don't want to take hours to get to a place and then stay only two days. The chart shows the historic average temperatures for the capital of Crete, Heraklion. As you can see, the summer temperatures are quite warm (remember these are average temperatures) and the lows are quite pleasant and sometimes hot. If you avoid July and August, you'll have cooler temperatures at night. By May, the high temperatures are getting quite comfortable, and the fall temperatures don't taper off much, so September and October, and May and the first half of June are ideal. Here you can see the average rainfall that hits Heraklion on the northern coast of Crete. It's a typical Mediterranean climate, with relatively wet winters and dry summers. In this example, it isn't expected to rain at all in July and August. The small map of Crete above shows you the shape of the island. The larger towns are all on the north coast, the blue lines indicate the numerous ferries that depart for Pireus, the port of Athens, and other island groups. 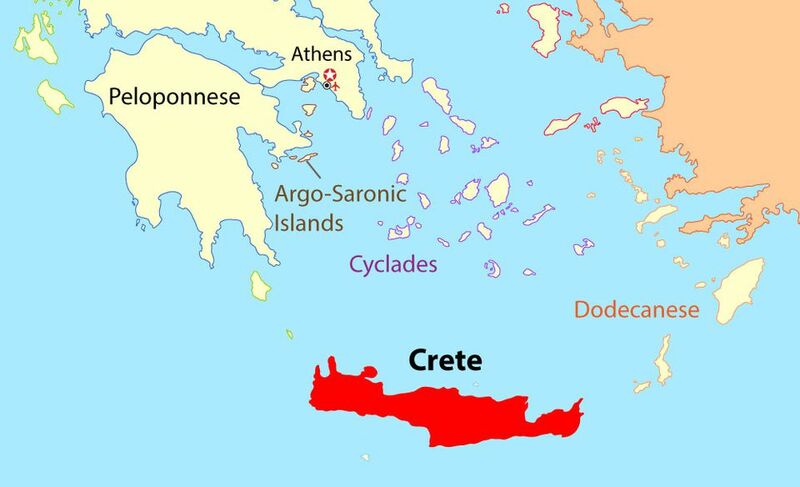 Crete is the largest of the Greek Islands and was the center of the Minoan civilization from around 2700 to 1420 BC. It is 160 miles (260 kilometers) across, west to east, and 37 miles wide at its widest point. Heraklion is the largest city, with over 100,000 inhabitants. Second in size is Chania with just over 50,000. One of the things that makes Crete a compelling destination is the diversity of cultures who have occupied the island: Minoans, Mycenaeans, Romans, Byzantines, Emirate of Crete (Iberian Muslims), Republic of Venice, and the Ottoman Empire. The palace of Knossos, south of the capital Heraklion, is said to be the first European palace. A visit to the Archaeological Museum of Heraklion will give you a good idea of the history. Chania, one of Crete's larger towns, is a great place for seafood served in many of the quaint restaurants near the harbor. To work off all that food, a hike through the nearby Samaria Gorge, especially in the offseason, is a way to get needed exercise. The Samaria Gorge is a narrow north-south oriented gorge that ends a couple of kilometers short of the small seaside village of Agia Roumeli. The gorge is within the National Park of Samaria, in the White Mountains. There is a trail through the gorge, open to the public at the beginning of May or so, depending on the weather. The distance of the trail is 16 kilometers (to Agia Roumeli, with restaurants and a ferry). In summer there can be 3,000 people wanting to walk the narrow gorge. The first tourist buses arrive at 7:30 a.m., so an early start is recommended for walkers who like a bit of solitude along the way. Generally, most people on a budget take a one-hour KTEL bus ride from Chania to Omalos walking the 2 kilometers to the trailhead, walking the gorge and ending at Agia Roumeli, where you can get a ferry to Chora Sfakion (Sfakion on the map) and a connecting bus back to Chiana. You can also take an organized tour to the Samaria Gorge from other cities in Crete. Wear stout shoes as the rocky path. The first couple of kilometers is a fairly steep downhill. Carry a water bottle; there are springs along the way where you can fill it. Central Crete is rich in archaeological sites and isolated rural areas like the fertile Lasithi plateau. These are some of Crete's best sites and another interesting hike, the Lasithi Plateau loop. From Crete's capital, Heraklion, the Minoan palace of Knossos is a few kilometers away by bus number 2 (from the port or Plateia Eleftherios). Travel agencies offer day trips to Knossos as well. If you're driving, take the road to Archanes out of Heraklion. Be aware that the palace has deteriorated and the "restoration" by Sir Arthur Evans in the early 1900s is a bit of a fantasy, but the sprawling complex is still fascinating. Buy a combination ticket and visit the Archeological Museum in Heraklion to get an understanding of the culture of the Minoans. Knossos is considered the oldest surviving city in Europe and it is built on even older, Stone Age settlements going back to 7,000 BC. Still being excavated today, Knossos is associated with the legendary King Minos, and the mythical maze prowled by the Minotaur. The stories arose because of frescos discovered in the Palace of Knossos that depict Minoan bull dancers. Phaistos is perhaps a more inspiring set of palace ruins than at Knossos, the hilltop setting certainly is. The palace is associated with the legend of King Radamanthys, the first legendary "Minos." Phaistos is also associated with some of the legends of Knossos. At Phaistos, you'll see two palaces, called the old and new palaces, built of ashlar blocks on different terraces. Inside are royal quarters, storerooms and workshops. There are also Minoan settlements on sites called Chalara and Aghia Photeini. You can also visit Gortys, 17 kilometers away from Phaistos, where it is said that Zeus made love to Europa under the plane tree. Phaistos is 62 km south of Heraklion. Regular public transportation is available from Iraklion and Rethimnon. Travel agencies in Heraklion also offer day trips. Relics from Phaistos—the most famous called the Phaistós Disk-—are found in the Heraklion museum. You may have seen pictures of the Lassithi Plateau showing an idyllic landscape dotted with Greek cloth-sailed windmills powering irrigation pumps. But now there is electricity, and these windmills are no more, except for a few preserved ones. But the plateau is still worth visiting, and it's still agricultural, ringed by small villages alive with the Greek spirit, and there's an interesting cave. The best way to reach the Lassithi Plateau by car is by the road from Neapoli, an interesting market town in itself. There are buses from Heraklion, and the bus that stops in Malia and Neapoli goes on to Agios Nikolaos. Enjoy walking the ring road around the plateau, which is an oval oriented east-west, 11 kilometers by 6 kilometers. There are 20 or so picturesque villages to visit. On a winding path west of Phychro is Dikteon Andron, the cave where Zeus was said to have been born. If you go by yourself, bring a flashlight and candles. People have used the cave as a place of worship through the ages. Mallia is both a modern city with a big bar and nightlife scene and an ancient Minoan palace, said to have been ruled over by Sarpedon, one of the three sons of Zeus by his captured bride Europa. If you want to get a hotel in advance, consider heading to Heraklion the town with the most options. Crete also has a number of vacation rentals, many along the waterfront—places you can walk to a beach from. One vacation rental site lists over 800 vacation rentals on Crete, from cottages and apartments to historic villas, many quite reasonably priced. For example, the​ Mirtos View Apartment Rental has a number of small apartments for two to four people within walking distance of the sea and the 18 family-run taverns that line the seashore. They'll rent you mountain bikes, or help you rent a car to get you there.